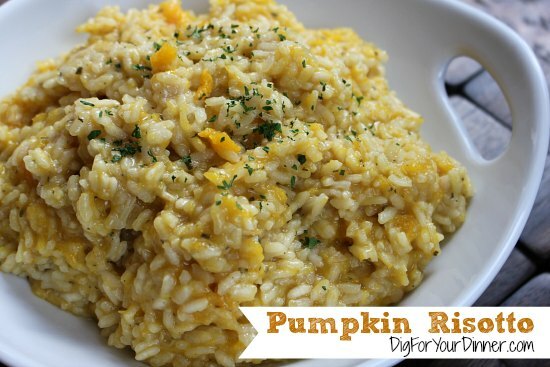 If you’re like me and can’t resist the urge to grow pumpkins or you have a surplus this year, this recipe for pumpkin risotto is so delicious, you’ll wonder why you’ve never made it before. I always thought risotto was super hard to make… but it’s not. Trust me. You can do this. Over low heat, warm the chicken broth in a small saucepan. While broth is warming up, saute the onion, salt, and pepper in the oil for about 4 minutes over medium heat. Add the sage and continue cooking for an additional minute. 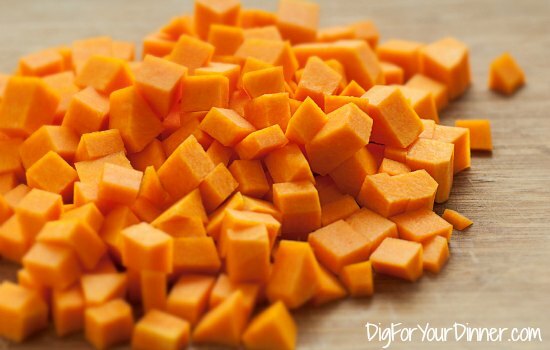 Add the chopped pumpkin and garlic and cook an additional 4 minutes. Finally, add the rice and cook for about 3 more minutes, stirring constantly. Add the wine or substitute and cook 3 minutes or until the liquid is absorbed, stirring often. Slowly add in the chicken broth about 1/2 cup at a time, stirring occasionally and waiting until it is absorbed before adding more. The risotto should take about 30 minutes from start to finish for all the broth to be absorbed. Remove from heat, immediately stir in the cheese and serve. Thanks Mavis! I’m always looking for savory squash recipes. This one sounds good.